Do your desires have you going around in circles? You may be looking for fulfillment in all the wrong places. The fact is, your longings are built from the blueprint of your needs: for protection, for love, for God. And those needs aren’t going anywhere. "The Longing In Me: How Everything You Crave Leads to the Heart of God" is one of my new favorites by Sheila Walsh. Sheila shares some of the trials she has faced in her life and intertwines them with the biblical story of King David. As both Sheila’s and David’s stories make clear, some cravings are misguided, but they all stem from the same hunger, which will haunt you until it is satisfied properly. The Longing in Me will help you understand that your cravings are not the problem, but it is where they lead you that makes all the difference. It's no secret that I'm a fan of Sheila Walsh. In 2011, I heard her testimony for the first time at a Women of Faith Conference, where I had an amazing experience. that forever shaped my faith. The book is easy to read. 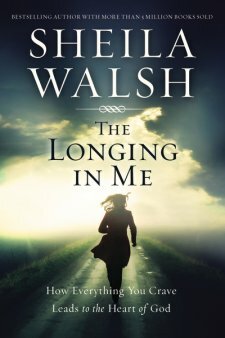 Shelia has a way of writing that she comes across to the reader as a loving friend. One who has been there at the lowest point too, has made it and wants to see you make it there. Backed by scripture, she shows us how this isn't a new thing that only affects us. Even King David struggled. This isn't a guide on how-to get over your cravings, but how to discern the misguided ones and help lead you to the One Who can satisfy them. This is a book that I will be rereading and recommending often. Disclosure: I received this book free from the publisher through the BookLook Bloggers book review bloggers program. I was not required to write a positive review. The opinions I have expressed are my own.